I found this unbelievable ensemble at the thrift store last year. An incredibly tailored silk/wool blend dress and coat--every seam is either piped or bound with bias binding. Too narrow for me, it worked for Clara when I took up the side seams. I left the excess fabric in place, though, I couldn't bear to cut into those gorgeous seam finishes. Rhinestone pave buttons do frost the cake, don't they? Stunning! I never cease to be amazed at the treasures awaiting discovery in thrift stores. What a find! It looks beautiful on her! Oh, my! This reminds me of that beautiful gray silk outfit you found a while back. What a great color - and it looks so nice on her. Absolutely amazing! What a beautiful ensemble, and a fabulous thrift store find! Clara looks so lovely and chic. Beautiful fabric and color. Good find! Wow - what a gorgeous find. I would love to fossick around in your thrift stores - mine don't have such wonderful treasures to be found. That color looks fantastic on her. Gorgeous! And the buttons are perfect! Got to love thrift store finds like that! That is delighful! It looks lovely on Clara! Unfortunantly anything like that would look frumpy on me with my curves, but she can pull it off and make it look amazing with her slender figure. 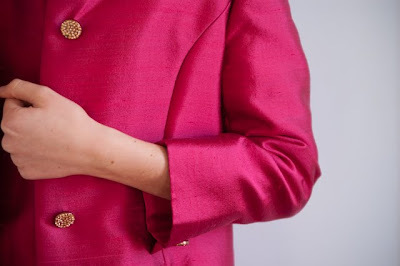 Because of that, I just have alway thought that a matching dress and coat are the epitome of ladylike dressing. Are you going to NYC anytime soon? If so, she needs to appear at the best restaurant in town wearing that outfit!